On the main drag in Wallingford, you’ll find an abandoned houseboat turned business serving stiff, seaward cocktails to regulars. Its interior is decked out with funky knick-knacks – a toy doll in a bird cage, strewn fishing nets and buoys, a wall of old keys. This is The Octopus Bar, a nautical-themed watering hole – and a Solid Ground supporter. 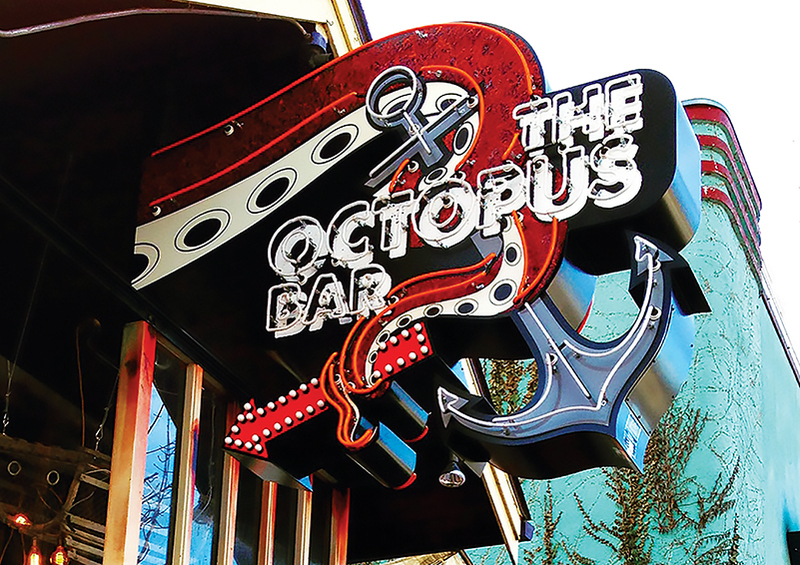 Since opening their doors in 2014, The Octopus Bar has organized annual fundraising events to benefit various community organizations, raising more than $101,000 in contributions over five years! Solid Ground is thankful to have been a recipient of their 8 Days of Giving campaign last year, resulting in a $5,000 donation to support those most vulnerable in our communities. Local businesses like The Octopus Bar are busting the myth that only large corporations can make significant impacts in our communities. In recent months, Solid Ground has seen more and more small businesses stepping up to the plate, coming up with creative and impactful ways to give back to their communities. QFC Stores chose Solid Ground to be their featured nonprofit of the month! Locations across King County are collecting donations at the checkout counter now through February 2, 2019. Donate any amount to help support essential services. Bar House in Fremont donated a dollar of every drink to Solid Ground every Thursday in November and December. Roxy’s Diner, another Fremont Favorite, created a Giving Wreath and a “photos with Santa” benefit to collect needed items and fundraise for Solid Ground over the holidays. Northwest Marketplaces (the folks behind the Fremont Sunday Market and Ballard Farmers Market) gave a portion of door donations at their debut Winter Solstice Night Market in December to Solid Ground. As Liza puts it, “If there’s a cause you care about and are excited about contributing to, you can find a way to make it happen.” Whether it’s donating a percentage of sales, collecting specific items that program participants have asked for, or offering up services or space free of charge, local businesses are uniquely valuable supporters of our work at Solid Ground. We are incredibly grateful for all the recent partnerships with our local businesses, and we’re encouraged to see these vital and vibrant partners join us as part of the solution to ending poverty in our community. After all, at the end of the day, whether you’re a community organization, a business, or an individual, we want the same thing in Seattle: We want a city where everyone can thrive. Interested in building a partnership with Solid Ground? Contact Corporate Giving Officer Phoenica Zhang at phoenicaz@solid-ground.org or 206.694.6852. Hi Greece, thanks for the heads up. Do you know what version of Explorer you’re using? If it’s very old, you might find compatibility issues. Things look fine on the newer versions.